"Passage de la Marne. 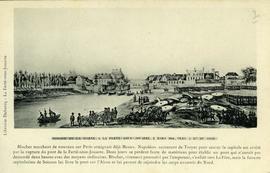 A La Ferte-Sous-Jouarre"
Depiction of the battle of.... The area was an important site for quarrying millstones. 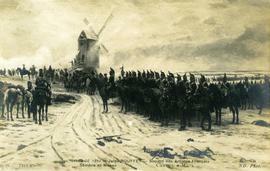 Painting by Jules Rouffet of a Napoleonic scene in front of an unidentified windmill. "Hondschoote - La Bataille d'Hondschoote (1793)"
Painting by J B Mauzaisse depicting the Battle of Valmy. "Flixecourt - Le Moulin de Pierres"
"Ruines du Moulin de Bussus, Bussus (Somme)"
"Camp de Chalons - Le Vieux Moulin"
"St-Pierre-Quiberon - Les Alignements du Moulin"
"Coudun (Oise) - Ruines du Moulin a Vent du Mont Ganelon"
"Environs d'Ancenis Un moulin a vent"
Handwritten note identifies the mill as Moulin de Juigné.